When Peter and John had gone up to the Temple for prayer [Acts 3], they saw a man who was lame from birth, and were moved to heal him in the name of Yeshua (Jesus). Immediately the religious leaders laid hands on them [Acts 4:3] and kept them imprisoned for a day. The following day, with boldness, they declared this miracle was done in the name of Yeshua. I love what the "religious" leaders said next --- "they perceived that they were unlearned men and they marveled at their boldness!" Why were they bold? They had been with Yeshua, and the leaders took note of that! 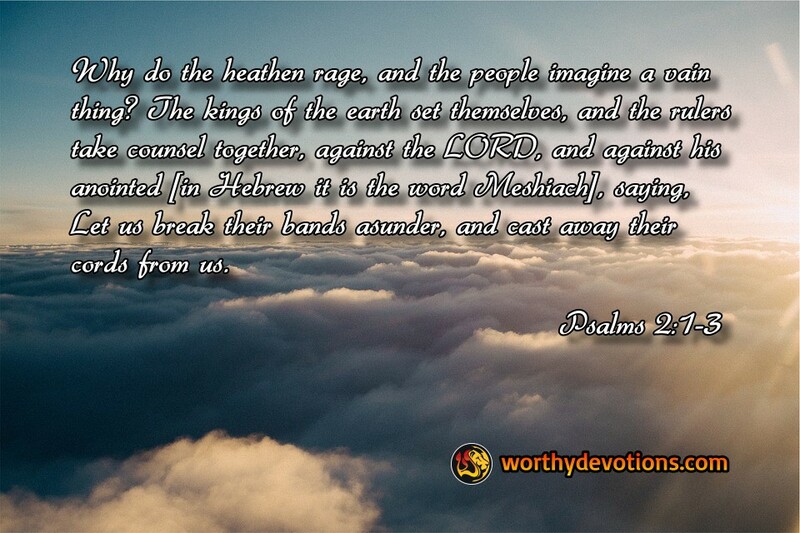 It is no surprise that the world rages against the Messiah. Psalm 2 declares it clearly. Every year there are tens of thousands of believers suffering and dying for their faith, in large part because the kings and the rulers of the earth RAGE against the Lord and His Anointed. As followers of the King, we should expect this and be prepared for it when it comes. But, the examples of Peter and John, and every other true Christian martyr are there to inspire and encourage us that if and when the time of persecution comes for us, we too can be bold as a lion. And this boldness is no merely human bravery, but an unction from the Holy Spirit Himself. So, though the kings of the earth will rage, our simple faith and Holy Spirit boldness will testify that we too have been with Yeshua! We have crossed over, now let's hold on! I have a question? Why am I not able to print some of your Scriptures and comments, so that I can share with the church members I worship with? If you look above, you'll see a line of half-shown symbols. The one to the far right is the "Printer Friendly" symbol you want to use to print off our devotions.